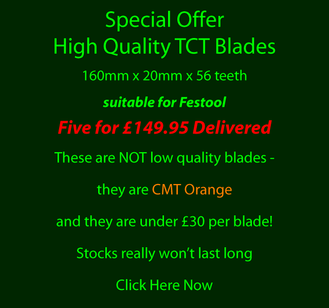 The Saw Shop is pleased to offer CMT TCT Saw Blades to our customers. CMT saw blades are laser cut and machined on automated CNC machines, from start to finish. Using superior quality super 42-44 Rockwell hardness steel, and micrograin carbide tips, to guarantee quality. Rest assured you are buying a product that will deliver extended life, and a superior finish. We have tried to give you all the information you need to chose the right blade for your machine and the work you are cutting, but please check your Instruction Book or contact us if you are not sure and need more advice. We have listed our most popular blades here, but please email us if you do not see what you need as we can supply any TCT Blade you need ian@thesawshop.co.uk All prices include delivery to UK Mainland which is normally within 5 working days. A = Front Angle. This could be positive (as shown above) or negative (as shown below). K = Kerf - width of tooth.